In the photo to the left, Mood Fabrics is showcasing a popular velvet fabric they have for sale. The pattern of the fabric features a repeating flower pattern with slightly different orientations and sizes. The colors gold and blue/green stand out to my eye. The gold is a very muted hue, with a lighter value in most areas. The gold velvet is very saturated. The bluish green color is very vibrant hue, and has a lower value compared to the gold. The saturation seems to be very high in this color. The contrast of the blue and gold intensifies the eye’s experience. The colors interact in a way that almost makes it difficult to know what to look at. Despite the foreground colors being very vibrant in hue, when placed close together they create a darker overall color structure. Together they create a darker almost victorian mood (amplified by the intricate pattern design). The darkness of the purple background creates figure/ground with more attention being drawn to not only the colors but also to the texture of the velvet. The dark purple contrasts with the reflective nature of the gold, which most likely would appear more muted if isolated. Blue and yellow (in this case gold) are primary colors and the greenish blue tint compliments the gold due to being near opposites on the color wheel. Together they almost clash, drawing the viewer’s eyes to the most important elements (the flowers and leaves). The pattern is very organic, you can see some similarities but there is no clear direction or repetition to the pattern. 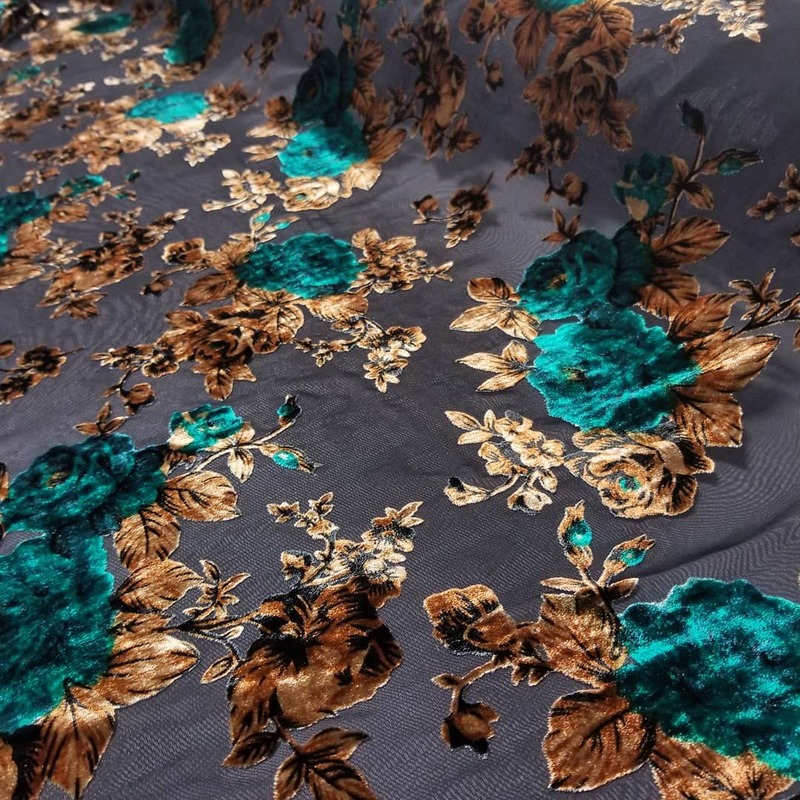 The changes in color indicate to the viewer the type of texture that the fabric is made out of, and tells us how were the pattern was spatially compared to the camera.